If you’re looking to score a Windows racing game that’s sure to get the adrenaline pumping, now’s your chance. 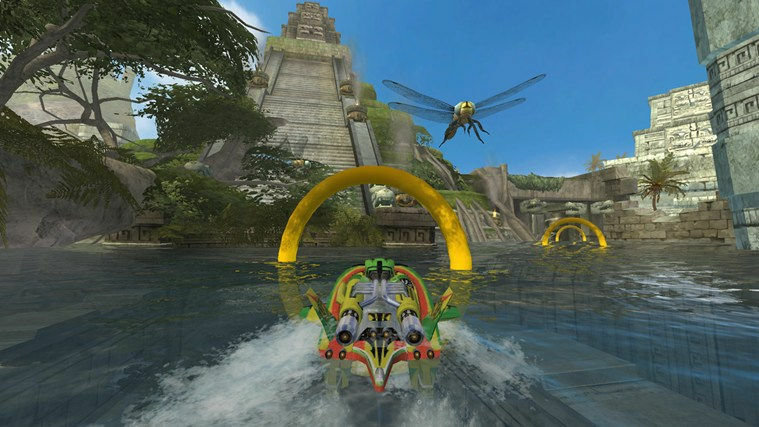 The speedboat-studded racing game published by Microsoft Studios is being offered for half price for two more days. Hydro Thunder Hurricane, the sequel to Midway’s popular Hydro Thunder game for consoles, features some gorgeous visuals and physics. 20 speedboat models and 11 environments await you, including well-known real-life areas such as the Bermuda Triangle and Area 51, and also Monster Island, among others. As with any good racing game, there are shortcuts abound in each level along with special events and interactive, destructible surroundings. Boost powerups, on-board rockets, and four game modes – Races, Ring Masters, Gauntlet, Championships — round off the in-game options available to you. ROLLER COASTER RACING. Fun, arcadey, over-the-top racing in 11 rich, beautifully themed interactive environments packed with shortcuts and surprises. ADRENALINE FUELD PHYSICS. Dynamic water physics delivers intense moment-to-moment gameplay on ever-changing, gorgeously rendered water-based tracks. ROCKET POWERED SPEEDBOATS. Master 20 classic and new rocket-powered speedboats with transforming boost engines, each with unique handling characteristics. FULL FEATURED EXPERIENCE. Classic arcade racing and a variety of all game modes including Gauntlet, Ring Master, and Championships. RACE AGAINST YOUR FRIENDS. Challenge yourself against your Friends’ best times in the all-new Ghost Race mode. RACE YOUR WAY. Control your speed boat with on screen touch, keyboard/mouse, Xbox Controller or tilt control on supporting devices. BECOME A TOP RACER. Earn Xbox Achievements and compete for top placement on the Leaderboards. Be sure to secure your own copy of Hydro Thunder Hurricane in the Windows Store here before the price reverts back to its normal $9.99 tag.